1944. 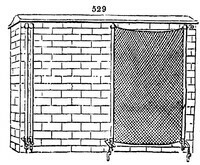 The netting screen (fig. 529.) 'consists of two deal poles, on which is nailed a common fishing-net, previously dipped in a tanner's bark-pit, to prevent its being mildewed when rolled up wet. At the top, the ends of the poles fit into double iron loops, projecting a few inches from the wall, immediately under the coping; and at the bottom they are fixed, by a hole at the end of each pole, upon a forked iron coupling, which projects about fourteen inches from the wall, thereby giving the screen a sufficient inclination to clear the branches. When it is wished to uncover the trees, one of the poles is disengaged and rolled back to the side of the other, where it is fastened as before. The most violent winds have no injurious effect upon shades of this kind; a wall is very expeditiously covered and uncovered; and there is not any danger of damaging the blossoms in using them: they occupy very little space when rolled up; are not liable to be out of order; and, although rather expensive at first, seem to be very durable. From the facility with which the screen is put up, it may be beneficially used in the seasons when fruit ripens, to secure a succession, by retarding the crop of any particular tree. The lower ends of the poles are advantageously retained in their places by means of a small iron spring-key, attached to the coupling by a short chain.' (Hort. Trans., vol. iv.) Canvas, oilcloth, or gauze screens, may be similarly formed and fixed.